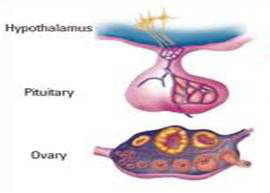 Hypothalamus controls the hormones of pituitary, which in turn controls ovaries. This is called Hypothalamopitutaryovarian axis. Hypothalamus is the head quarter of limbic System. It is a part of brain which receives all the sensory information from thalamus & gives rise to emotions. These emotional reactions give rise to our actions. Hypothalamus is constantly in communication with cerebral cortex. It receives sensory information, for vision,smell,hearing,taste,and fine touch form body. Its’ function is to analyze it, store it, learn from it. If our cerebral activity is over functioning, it sends different signals to hypothalamus, disturbing its’ function. Strong emotions arising at hypothalamus are also conveyed to cerebral cortex, which reacts to them by signaling hypothalamus. Thus there is a to & fro communication between both of them. Emotions like fear, anxiety, insecurity, frustration offen lead to hypothalamic dysfunction. Yogic Health Science helps in these situations by Ashtang Yoga. Cognitive corrections, emotional stability and psychological strength are gained by it. Hypothalamic dysfunction, disturbing function of HPO axis, in reproductive phase of woman’s life is greatly helped by Yogic Study. We have to rule out organic - pathological cause for such complaints before we label it as Hypothalamic Dysfunctional disorder. We advice Medical Yoga Therapy in such cases. 2 days - Basic Posture Sequence.